Pendant votre journée au port de Skagway, profitez de votre temps pour découvrir les trésors de la région du Yukon, le territoire le plus à l’ouest du Canada. Cette visite complète vous fait voyager le long de Klondike Highway en monospace, avec des paysages montagneux qui vous impressionneront. De nombreux arrêts photo sont effectués et vous aurez de bonnes chances d’apercevoir des animaux sauvages. Une fois dans la région de Carcross, visitez le poste de commerce Caribou Crossing, avec son musée et son camp de chiens de traîneau, où les huskys s’entraînent pour la course en traîneau du Yukon Quest. Vous pouvez vous surclasser et profitez d’une expérience en traîneau à chiens en compagnie d'un meneur d’attelages le long d'une piste boisée. Vous allez aimer vous imprégner de la beauté sauvage de l'Alaska, de la Colombie-Britannique et du territoire du Yukon lors de cette excursion sur les rives de Skagway. Des paysages magnifiques, des animaux sauvages et du temps passé avec des huskys de traîneau, comment imaginer une journée plus parfaite pendant que votre bateau de croisière est amarré au port de Skagway ? Votre excursion sur les rives de 6 heures et demie vous emmène vers le nord le long de Klondike Highway, une route parallèle à la piste de la ruée vers l’or de 1898, le long de votre parcours vers la frontière américaine/canadienne. Gardez les yeux bien ouverts pour les éventuelles rencontres avec des animaux sauvages, notamment des mouflons de Dall, des chèvres de montagne, des orignaux, des ours noirs et des caribous des bois. À l'intérieur du Canada, serpentez à travers la forêt boréale nordique pour des vues spectaculaires de l'île Bove et des lacs Tutshi et Tagish. 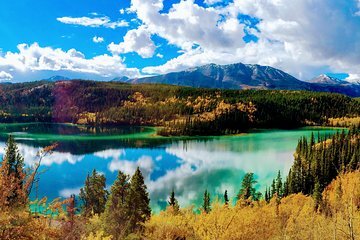 Faites une pause pour un arrêt photo à la frontière du Yukon et ensuite continuez jusqu'au lac Bennett. Prenez des photos du « plus petit désert du monde » et du lac Émeraude. Arrivez au carrefour du poste de commerce de Caribou et dégustez la savoureuse cuisine de la région du Yukon, qui comprend du poulet sauce barbecue, des pommes de terre rôties, de la salade coleslaw, des petits pains, des beignets et du café. Maintenant que vous vous êtes réchauffé, entrez dans le musée d’histoire naturelle du Yukon qui abrite d’impressionnantes expositions sur la faune et la flore, sur l'âge de glace ou sur des espèces animales plus récentes. Des animaux des régions arctique et subarctique de l'Alaska et du Yukon, ainsi que d'autres régions du monde, sont également exposés. Profitez ensuite du camp de traîneaux pour chiens et profitez d'une expérience pratique et des photos avec les huskys et leurs adorables chiots. Après avoir passé du temps avec les huskys, montez à bord de votre véhicule et détendez-vous sur le trajet de retour vers le port de Skagway. Veuillez noter : tous les passagers doivent posséder un passeport en cours de validité. Nous assurerons votre retour rapide à votre bateau à Skagway pour cette activité. Si votre bateau est retardé et que vous n'êtes pas en mesure d'assister à cette activité, vous serez remboursé. Consultez nos conditions générales pour tous les détails. This was an EXCELLENT tour. Our tour guide, Tyler, was lively, extremely knowledgeable, personable and funny. The 1 reason I chose this tour over the White Pass railroad were the number of reviews that lamented the fact that you couldnt get out at all. We had a climate-controlled minibus with only 21 people. Compare that with the NCL Pearl excursions that were considerably more expensive and left in mega-buses that were 100-200 people deep each. The drive out to the Yukon was absolutely gorgeous. You pass through Alaska stopping to take photos at the Welcome to Alaska sign, British Columbia and the Yukon also taking photos at the sign. We were able to stop and get out to take photos at various locations. We saw mountain goat as well as an eagle extremely close to the road and raven. We went everywhere as described. In addition, though I didnt take the sled dog ride as it was on a wheeled vehicle instead of a sled due to the lack of snow I was able to pet the puppies. In addition, we stopped and drank some glacier run off water from Bridal falls only 3 of us dared and stopped at the actual Carcross town as we had extra time and got our passports stamped. I would advise that at Caribou Crossing where the dog sled adventure and lunch is that you go to the Taxidermy museum and exit through the rear door. There you can pet and for only 1 a bag feed a pure black stallion, mini-horses, donkey, alpaca and/or goats. This was an awesome tour! Our guide, Aaron, was extremely knowledable of the history, friendly and made it a fun adventure. We stopped several times and saw beautiful sites. Lunch was delicious,also! I highly recommend this tour. You won’t be sorry! My original plan is to join the half trip of white summit pass train and half bus trip. But then that trip is full so we turned to this mini bus trip. It is so cool the driver will drop us off at any lovely and special scenery for photos. We also have a chance to do sled dog rides! At last, I even think this excursion is far better than my original planned one!! This is the second time that I have done this tour, and I would do it another time. The things that you get to see are wonderful and the tour guide (Brooke??) was amazing in pointing out wildlife and the other sights. She was extremely safe, and made sure that everybody got to enjoy the sights in safety. The was cautious of the impact we had on the wildlife and made it an amazing experience for everybody. Our 10 year old daughter also went with us and she had a bit of an upset stomach at one point. The tour guide made a special stop so that she could use the restroom and it was very much appreciated. Great tour - give it a try!! Great bus tour of Yukon with multiple stops. Incredibly scenic. Dog Sled/Iditarod training was worth the visit! Bus driver was a great tour guide. Our driver Patrick met us in the parking lot right after the cruise ship pier, and he quickly seated everyone in our relatively small minibus (I think we had about 15 people).He drove through Skagway, pointing out some highlights along the way (to be honest, not many in the city), and then we were on our way north. The tour description is exactly correct: lots of scenic photo stops along the Klondike highway route, gorgeous green Emerald Lake, Tutshi, Tagish and Bennett Lakes, unique Carcross desert, and so on. We had a lovely day - sunny and no rain. Unfortunately, we did not see much wildlife, but the varied landscapes, in both Alaska and the Yukon region of Canada, more than made up for this. Patrick pointed out highlights along the way, and he kept us amused and entertained. One nice personal touch that he provided: At several scenic spots (for example, the Welcome to Alaska sign), Patrick took photographs of each couple or group of travelers.So why take the bus and not the train? The minibus stopped many times along the route, both on the way up to Carcross and on the way down,, for photo opportunities. When we got back to the cruise ship later that day, we spoke to those who had taken one or another train alternative (there seemed to be many possible train choices), and they were all envious of our trip. The train ride may be a bit more scenic (and historic), but we had many more chances than they did to get out see the countryside. This is such a great tour. Tyler (T-bone) was our tour guide and was amazing. He was very knowledgable about the area (7 of us ages 18-50 asking questions) AND was he courteous, kind and helpful to all the passengers. We saw the true beauty of the Yukon highway and learned about the area. We had multiple stops on our way to Carcross and then had a great BBQ lunch when we got ther. To add to the trip, the museum, petting zoo and husky puppies were a delight! We LOVED this excursion! We absolutely loved this trip. Tyler (T-Bone) was our guide, and Nathan was his assist. We enjoyed every second. Tyler was a 10 star guide, and was fun, informative, and extremely accommodating to my 82 year old father, who is somewhat limited in his mobility. I am incredibly grateful both for that, and for the experience. So happy we took the bus route which allowed us to get off. The sled dog experience, which Tyler insisted my father take part in and helped him to do, was so enjoyable! Tyler, if you are reading this, thank you SO MUCH, and a gift package from NH will be on the way. Thank you to Frontier!! Our guide John was excellent and super knowledgeable of Skagway, the Yukon and Canada. We had a tour bus with 17 on board that was comfortable and he spoke clearly and had a great personality. 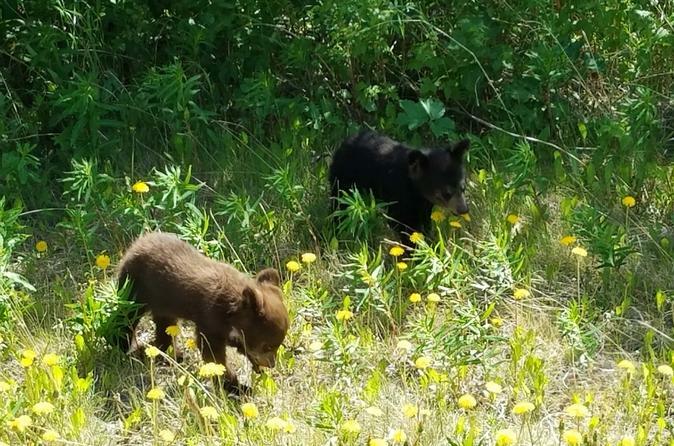 We stopped several times for photo opportunities and stopped for a cinnamon colored black bear eating berries on the side of the road. We also loved the dog cart experience and lunch! Great day, and would do this tour again!